I intend to post this progress on Monday but because of the super typhoon Pablo, this has been delayed. Good thing Pablo has changed its track earlier last night. Senior Santo Niño and Saint Pedro Calungsod are safeguarding Cebu from any kinds of natural calamities. Thank you so much God! 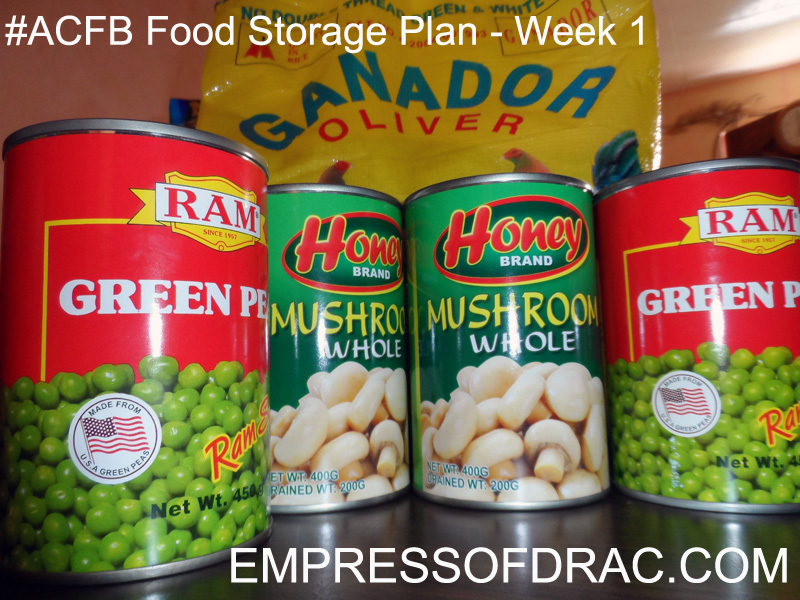 As I mentioned in my 1-Month Basic Food Storage plan, my food storage stock for week 1 is consist of a 5-kilo rice and 4 canned goods. I bought all these during Metro Gaisano’s 1-Day Crazy Sale but these items were not on sale. I forgot to recheck their prices but I approximately bought them all for Php402 or $10.05. I am currently contemplating if I’ll ask a carpenter to build me a food storage stand or if I’ll just buy a big plastic food storage container from the mall. If I’ll buy a plastic container, I won’t have any problems when moving time will come. So, I think the latter is a better choice. I’m not sure if I can keep up with my list for week 2 as I will start buying stuff this weekend for our Christmas dinner. I already have a dinner menu but I will modify it to make it more frugal as possible. I’m still figuring out where to put my category link in my header file as the current theme doesn’t support my page mash plugin. I’m also planning to put an advertisement and product review page. There are lots of things to do that in worst case scenario can put this blog in a shutdown mode.